Investigators believe Des Moines man fell to his death. Update: Police have identified the victim as 31-year-old Michael Paul Nemmers. Des Moines Police believe a man found dead outside an apartment building this morning died as the result of an accident. 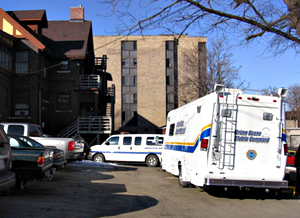 Investigators were called to the scene, just west of downtown at the corner of 35th Street and Grand Avenue around 8 a.m.
Shannon Arthur, who lives in the building and serves as landlord, says it appears the victim had locked himself out of his apartment and tried to climb on the roof to get back inside. Another tenant reported hearing someone on the roof at 3 or 4 a.m.
“He went to look and see if somebody was breaking in and he didn’t notice anything, so he just went back to bed,” Arthur said. The victim’s name has not been released. Arthur said the man was “young – in his late 20s or early 30s.” The victim was not wearing socks or shoes. Another tenant of the building told police the man had been at his apartment. “His friends are saying he was over at (their) place and then left,” Arthur said. “And, for whatever reason – three or four in the morning – he decided not to come down and knock on my door and say, ‘hey, can you let me in,’ and he tried it himself.” It marks the second time in one week that a young man has died from a fall from a building in Des Moines. Last Friday, police said 28-year-old Kirby Praseuth of Des Moines fell from the balcony of a downtown apartment building. It happened as state drug agents conducted a search of the building. Authorities said Praseuth ran to the roof and somehow fell – four stories – to the ground below.